Meet Kemi and Khalid, they are both from Nigeria living now in Houston. Kemi reached out to us to capture their engagement photos and we were so happy she did. They are the cutest couple! Their actual wedding will take place in Nigeria in 2014. 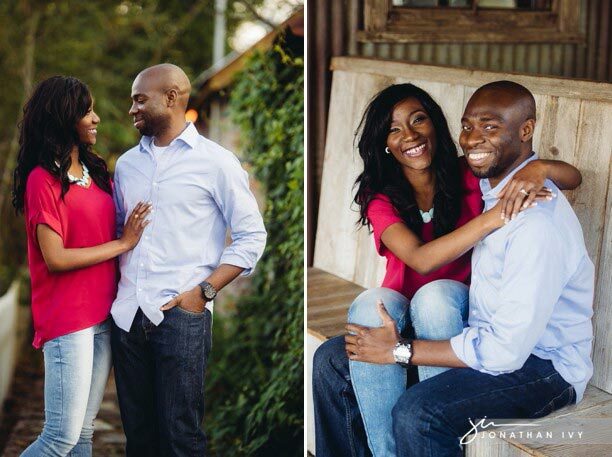 Here are just a few of our favorite images from their engagement photo shoot in North Houston. LOVE that they incorporated one of their hobbies to the photo shoot: Soccer! I have to admit I am totally and completely jealous of Kemi’s gown in this photo. Its stunning and created by her with the top being traditional American and the bottom being traditional Nigerian attire. Swoon!